Bible Land Shop's Biblical Gift Packs collection includes Biblical Jerusalem Soil from the Holy Land, Jordan River's Water and Galilean Virgin Olive Oil. Grab the essence of Judean Jewish and Christian Jerusalem and Bethlehem, feel the Holy Water of the Jordan valley as King David, the Twelve Apostles and Jesus felt and were refreshed by, and taste the very same Galilean Virgin Olive Oil as were tasted by the Biblical Village of Nazareth's Galilean inhabitants. 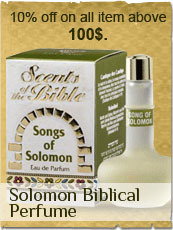 Don't miss the latest beauty gift sets from the Holy Land of Israel. Check out our extended range of Holy Land Elements Holy Land gift packs and Holy Land gift packs of earth and stones from Jerusalem, olive oil from the Galilee available here.